Not able to output datetime to text view in Ui. Hello everyone. I am new to the forum and need some assistance. 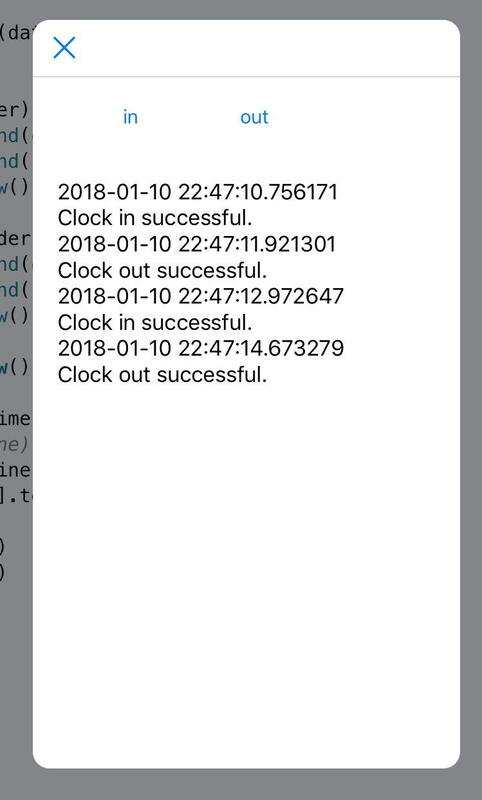 I am trying to put together a small script with a basic UI for my own personal use to help me keep track of my hours at work when I am working off site jobs which seems to be happening a lot lately. Basically I am trying to set up the UI with 2 buttons, clock in, and clock out. And I need them to print the current time when tapped to the text view. All while appending to a list that I can view at the end of the week. So 2 questions here. How do I get the current date and time to the text view? They print in the console but nothing I try gets them to the text view so I am stuck. And how do I make the list save itself and pickup where it left off? Thank you. Here is my code so far minus all the trial and error with the text view. Thanks for any advice. timecard. text += '...', I forget whether text is directly modifiable. You probably want to add \n each write or append. Ok cool. I will try this out as soon as I can. Thank you. I will post again after my lunch break and let you know if I have any success. Still no luck getting a result on the text view. This is where I’m at. what class do you think timecard is? If you are not sure, add some print statements to your callbacks, and find out. As a hint, you refer to two completely different variables both called timecard in your code. Forgive my lack of understanding here as I have only been learning python for about a week now, but you said I was using 2 different variables to define ‘timecard’ but wouldn’t a list be an object and not a variable? Anyways, I’m pretty much dead in the water here because I get what I am looking for in the console however the actual text view itself isnt displaying anything. This is the code I have right now. I didn’t even notice, thank you! Still no luck however. Wow! Exactly! I have to say that this forum has become my new favorite place. Thank you for being so helpful. I can tell I still have much to learn just by looking at how you wrote the same script that I was trying to write only much more tidy (and it actually works). If I may ask, how long have you been writing code and can you offer any advice as far as a newbie such as myself learning code? I am trying to start with the basics but I find some concepts to be slightly confusing (such as trying to understand the concept of everything being an object). I have always been ‘computer savvy’ but Pythonista is the first and only coding experience I have ever had and I am really enjoying it thus far. I appreciate all the effort that has gone into building such a wonderful support system. Thank you again. @meleyz I write code since years but not a lot in object oriented programming languages. I'm really not very good in Python and I've written this little script not as I would do for me but trying to follow your directions. This is not a complete list, there are here a lot of marvelous guys, always ready to help you with real skills. @meleyz, not to confuse you but datetime is not the easiest modules to work with. Especially as things get a little more complicated. I am doing some things with dates and times at the moment. I am using a module called arrow. The arrow module ships with Pythonista, but the docs for arrow are not built into Pythonista's help file. You can see the docs here. Again, I dont want to confuse you. But there are a number of modules that have been written as replacements/wrappers to the datetime module to simplify working with dates and times. I can see you usage at the moment is quite modest, but you might want to start adding extra functionality. I also love this forum. Very nice place, a lot of nice guys. Thanks! I was actually wondering that myself, about shortening the code that is. And thank you @Phuket2 for the information and documentation link. I have been trying to absorb as much of the documentation as I can and not just assume that it doesn’t explain things. I’ve noticed several posters mention that the documentation falls short however I have noticed that the documentation is actually quite thorough if you take the time to read and really try to comprehend what it is saying. I will definitely take your advice on the functionality aspect and I am also trying to build good habits when writing code (such as proper format and leaving myself comments to remember what I am doing). This is how the code looks now and I am currently researching how to change the datetime output format to improve user friendliness. @cvp I will shorten the codes on the button functions when I get home from work. Thanks again. I found the Arrow module to be much easier to use and the documentation was very helpful. I have updated my code using it. Thanks! @meleyz , thats great. When it starts getting very useful is when you have to start worrying about about time zones. In this case it appears that time zones are not important for you. From what I have read and seen etc, the best strategy if you are saving date/times is to save them in utc format (timeoffset +0). Then when you need to display your datetime (arrow object) convert the utc time to your time zone. It's a few extra steps, but arrow makes it very easy. You have the utc = arrow.utcnow() method and the utc.to('Asia/Bangkok') or utc.to('local') methods. You can also use the utc.for_json() method or str(utc) to write the arrow object datetime as a string to your text file. When you read the text back in you can use the utc = arrow.get(datetime_text_from_file). Maybe this comment seems over the top. If this is the only thing you every do with datetimes , then it probably is. But if you plan to work with dates and times more, from what I can see the safest bet is only ever save utc times and then convert them into the appropriate Timezone. Maybe others disagree, not sure. But I find dates and times find there way into projects many times. Good to have a std approach and one will work on web servers etc. Imagine you call arrow.now() on a server somewhere in the world. The result could be anything depending on the servers settings. Again, i just bring it up as it was something I struggled with when I was/am working with dates and times. I think you answered one of my questions before I even had a chance to ask it. And no it is not over the top it is exactly the type of information I am looking for so thank you! I am trying to add a switch to the UI to change between 24 hour format and regular format however I am getting a type error ‘must be str not function ‘ and I am a little confused. Perhaps I am calling the function incorrectly of I have not used the proper statement. I have tried a for statement as well as a while loop and am seeing 2 different errors. The one I just described and a positional argument error on the oTime function. I will comment in the code which line is returning the type error. oTime is a function. Thus, append(oTime) is trying to append a function. You want append( oTime() ). Of course, your oTime function is going to tive you some infinite recursion problems! @meleyz, I think the below should help. No need to make 2 instances of the arrow object. Also the formatting can be applied in different parts of your code, depending what makes sense for you. In your case, really you dont need the function oTime. As you did in your code you can call the method in place. Also your calls to timecard.append(oTime) should be timecard.append(oTime()). You are calling a function, so you need to add the ().